Gold and silver prices are at a critical point. It appears that we will see massive price movements up or down, soon. In 1966, the Dow made an all-time while the Dow/Gold ratio peaked. It took about 17 years from that peak (1966 to 1983), for price to break sufficiently higher than that 1966 – level. Furthermore, about three years before the breakout, the gold price made a significant all-time high (in 1980). Today, the Dow recently (at the beginning of 2017) made a significant breakout from a resistance line that has been in place for about 17 years since the Dow/Gold ratio, and the Dow (at that time) made an all-time high. In a similar manner, to the 1983 scenario, gold made a significant all-time high years (about 5 years) before. A breakdown at the bottom red line, could mean that prices could continue to follow the 1980s pattern, and go lower than $1000. A breakdown at the bottom red line, could mean that prices could continue to follow the 1980s pattern, and go much lower than point 4. A major fundamental reason why the current scenario for gold and silver will not play out like it did in the 80s, is the massive debt levels combined with the interest rate cycle which appears to have turned (with higher interest rates coming). Author’s note: For more on this and this kind of fractal analysis, you are welcome to subscribe to my premium service. I have also recently completed a Silver Fractal Analysis Report as well as a Gold Fractal Analysis Report. 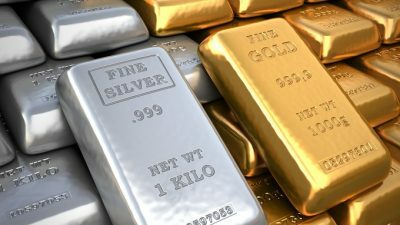 You can also subscribe to this blog (enter email at the top right of this page) to get my regular free gold and silver updates.